In the first of a series, we explore a variety of diamond shapes starting here with the Cushion cut. We hope that these are a brief, yet informative guide to help you select that ideal shape for your finger. The Cushion cut distinguishes itself in the shape of a square with rounded corners – hence a “pillow-like” look that matches the name. This is a personal favourite diamond shape for me because you can get a square or rectangle (for those who like geometric symmetry) but without pointed corners (which pose the most risk to the diamond being chipped). The rounded corners give a soft feminine feel, while the square or rectangle shape gives “a big spread” over the finger – in layperson’s parlance – the shape presents itself as a huge sparkling rock on the finger! In modern times there are a variety of “modified” cushion cuts – such as a rectangle with rounded corners, cushions with chequer-board or other fancy facet shapes that get called – “broken glass, crushed ice” and so on. 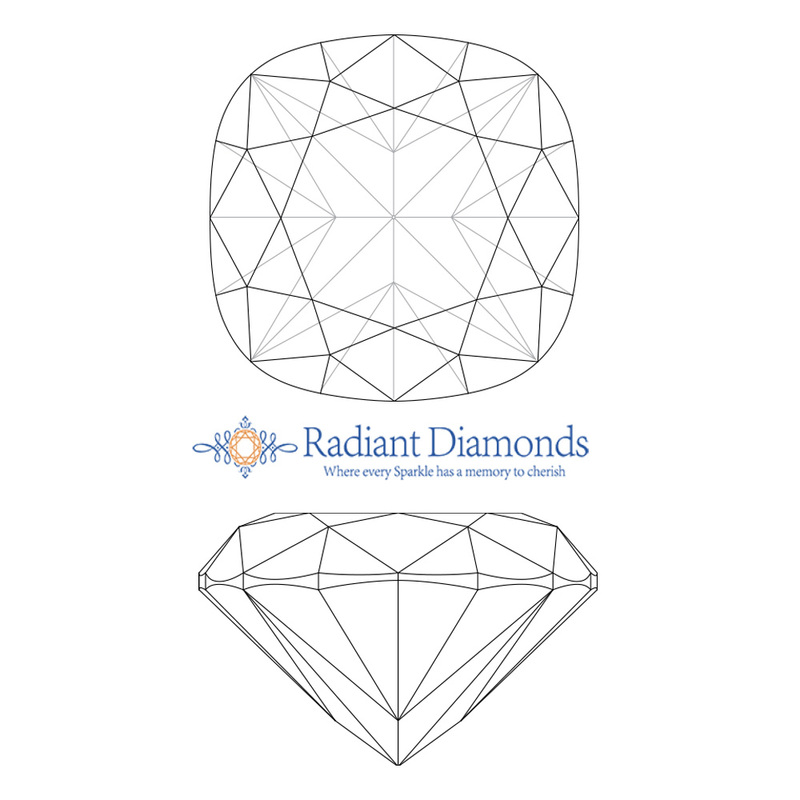 Among the various diamond shapes, the Round Brilliant cut is by far the most popular and has a long history of development through to its present day form – the modern Round Brilliant cut. However, the Cushion cut also has a long history. It has been around for 200 years! It was traditionally called the ‘Mine cut’ – named after the Brazilian diamond mines. 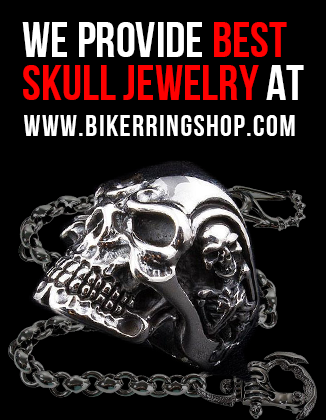 The shape has been very popular in its time because it is very versatile and looks good not just in a ring but also in pendants, necklaces, earrings and bracelets. This shape retains colour very well and it is a popular shape for fancy coloured diamonds (yellow, cognac, champagne or pink), or coloured gemstones (sapphire, ruby, emerald). The cushion cut diamond offers plenty of versatility and can suit every kind of taste. It can be toned down to a very simple and classic ‘solitaire’ (single stone with claws or a bezel). You can go for maximum ‘bling’ with a ‘halo’ look with smaller diamonds set all around the main centre stone. Besides the halo, another ‘non-engagement ring’ look can be a 3-stone setting with the cushion cut in the centre and (say…) trapezoids, heart-shapes or tapered baguette cuts on either side. So how does this shape compare in price with the highly popular Round Brilliant cut? As is the case with all fancy shape diamonds, the cushion cut offers enormous value for money. In fact, you will get a bigger fancy shape diamond for the same money as a Round Brilliant. This is because diamonds are cut for weight and a cutter will prefer to cut a bigger, heavier stone from various shapes of rough diamond crystals. 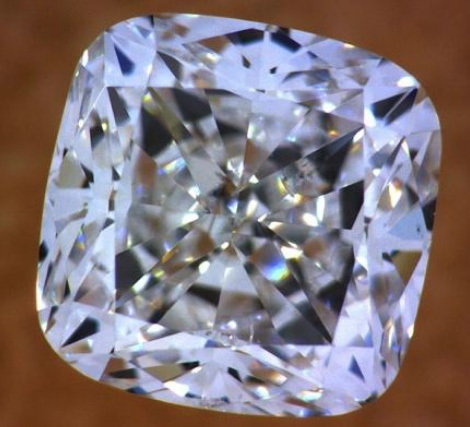 For the same reason (diamonds being cut to maximise weight), the fact is that the vast majority of fancy shape diamonds are dull and lifeless. Yet most celebrities prefer to buy a fancy shape diamond and not the more popular Round Brilliant cut diamond. That is because they get more value for their money with a fancy shape diamond like the Cushion cut. The entire category of fancy shape diamonds, including Cushion cuts, can be up to 30% cheaper than the equivalent Round Brilliant. Who wouldn’t like the biggest rock that money can buy? Secondly, there are diamond experts who guide celebrities to buy the right diamond with maximum sparkle. These diamond experts help source well cut fancy shape diamonds, where the stone has not been cut in a way that hides unnecessary weight in certain facets and hence, causes leakage of light that makes it dull and lifeless. And this is what I do for my clients as well. A Gemmological Institute of America (GIA) or other independent laboratory diamond certificate is no guide to the sparkle of any fancy shape diamond because “cut grade” is only measured for Round Brilliant cuts. So buying off a Certificate, or online or via an ill-informed or poorly trained sales person is fraught with risk. One needs to consult a diamond expert who has the wealth of knowledge and ability to source the best value diamond in terms of size, sparkle and price. Table 1 below illustrates the issue of price versus size. 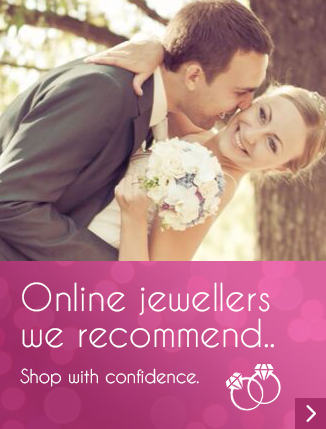 36% cheaper than the Round Brilliant cut diamond and of the same colour and clarity. 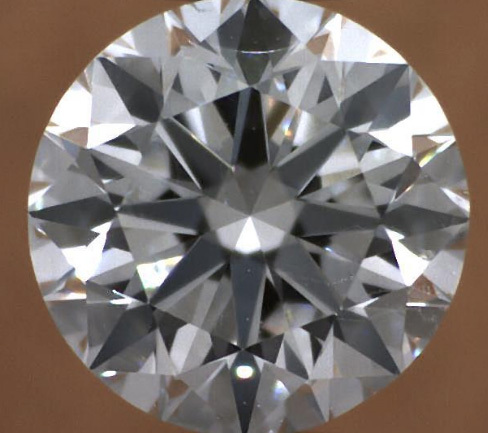 65% more expensive than the Round Brilliant cut diamond, but this is a much bigger diamond with the top colour (D) and a higher clarity (VS2). 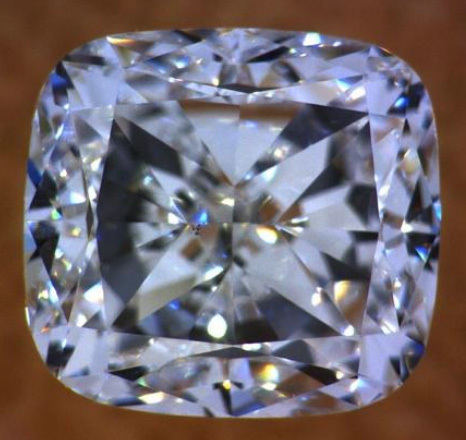 Whereas, a Round Brilliant of this size (1.50ct) and quality (D/VS2) will be double the price of this diamond. If well chosen, the cushion cut diamond offers enormous value for money because it comes with a big surface area or “spread” that means more sparkle, and you can end up buying a stone that is much bigger than you anticipated. This article was written by Amit Laxman, Radiant Diamonds, Melbourne, Australia.